"I hope you develop an incurable case of boils in your crotch region." Paints quite the picture doesn't it? This was the sentiment Shannon Loys expressed to the thief who stole a bike belonging to her husband, who has survived cancer three times. Fuelled by rage, she made a poster addressed to the "steaming pile of garbage bike thief" in the hope it would lead to its return. What happened next has provoked a heart-warming reaction on social media. With the help of a kind-hearted homeless man called Kevin, her husband Andrew again has his bike, which had been specially adapted to meet his physical needs. It seems the tirade on the poster - and the thought of developing boils - did the trick, with Kevin admitting to Mrs Loys it scared the thief and that's how it came into his possession. She told the BBC: "I put the flyer up to vent to the universe. I was upset. "It was from the heart and gut-punching." But it was not as simple as a quick return, because first Mrs Loys had to find Kevin. After seeing the fearsome flyer, he had asked a woman to call the number on the poster and explain he had the bike and wanted Mrs Loys's husband to get it back as "he's had a rough time". But all Mrs Loys had to go on was that Kevin had been outside a Fred Meyer shop in Fremont in Seattle on Sunday night with a cart attached to his own bike. And so her quest began. Unable to sleep after the call at 23:00 PST (07:00 BST) and with a description of Kevin being her only other lead, Mrs Loys got up and drove down to the shop to find him. "I thought it was probably a wild goose chase but I decided to see if there was anything in it. I had no other leads," she said. After a few loops of the area and reaching some dead ends, she stumbled across a homeless encampment and approached it, asking for "the guy with the bicycle cart". A little while later, and after rejecting the offer of some drugs and confirming she was not with the police, Kevin appeared with "a big smile flashed across his face". "We all peered into the back of the cart and there was, to my absolute shock, my husband's bike," said Mrs Loys. "He was so convinced it was my bike. I was sceptical. I was not expecting to get it back. It was not until I saw the pedal I knew. "Kevin was so sweet. He had clearly been guarding it. He was on a mission to get it back to us. "I don't know who stole my husband's bike, but I know for sure it was Kevin who gave it back." 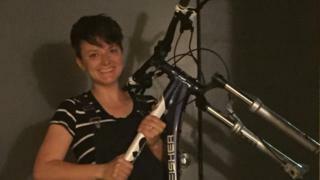 Describing the moment she returned home with the bike, Mrs Loys told the BBC: "I turned the light on and woke up Andrew and was holding his bike. "He has had some bad luck in his life...so getting it back meant more than the bike itself." She shared her story on Reddit, and it has had more than 20,000 upvotes and provoked a warm reaction. The couple have also had an offer from a well-wisher to pay for the bike's repairs. As for Kevin, the couple went back to the camp and gave him $100 (£78), a hot coffee, some food and a thank you card. "He was as nice as I remembered, really sweet," she added. "He was so worried someone would think he stole it."